The Three Highest Peaks Of Bulgaria - Guided Hiking Tour. 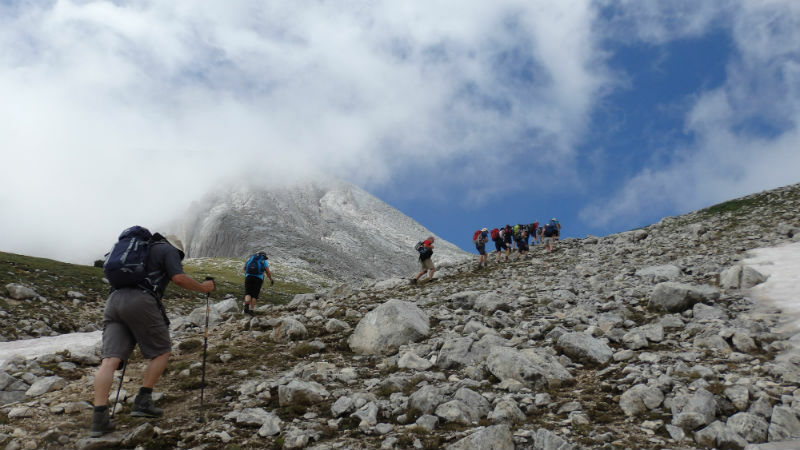 Trekking In The Balkan Mountains, Rila And Pirin Mountains. This is probably the most challenging of all guided hiking tours we run. Within a week time you will be able to climb the giants of the three most notorious mountains in Bulgaria – Rila (Mt. Musala, 2925m, being also the highest on the Balkan Peninsula), Pirin (Mt. Vihren, 2914m) and the Balkan Mountains (Mt.Botev – 2376m). Incidentally these three summits are located in the territory of the three national parks in Bulgaria and along with their purely hiking merits you will be able to enjoy stunning panoramas, unique nature phenomena, diverse and rare flora and fauna. Carefully chosen and scenic walking routes will allow you the possibility to explore on foot the best of Bulgarian mountains and test your personal stamina. Very difficult/challenging itinerary for really fit hikers with previous experience in mountain trekking. There are no acclimatization or preparation walks planned in this itinerary, so please do your best to get in shape prior departure in order to fully enjoy the climbs and the majestic beauty of the three summits. Day 1: Meeting at Sofia Airport and transfer to Plovdiv for overnight stay. Plovdiv is one of the oldest settlements in Europe and the second biggest town in Bulgaria. If we have free time in the afternoon we will tour the Old Town, which offers a cocktail of unbelievable stories, heroic legends and breath taking architecture from different historical periods. It is an authentic open-air museum preserving exhibits from Thracian, Slavic, Roman, Turkish and Bulgarian times – all located within a walking distance from each other. Day 3: More stunning panoramas expect us today as we continue hiking up along The Tarzan’s Trail towards Mt. Botev. Sheer slopes, lush green meadows and vertical rock faces will be accompanying us on our way to the highest peak in the Balkan Mountains. Once we have made it to the top we will descend along another scenic route, revealing views to The Northern Dzhendem Reserve and the main ridge of the mountains. Passing by the Rai Hut we will descend further down to where we started the day before. Here we will board our van and transfer to the Rila Mountains and the charming village of Govedartsi – our base for the next three nights area. Overnight in a family-run pension. (7-9 hrs, uphill/downhill walking: 850/1600m). Day 7: Today we will attempt Mount Vihren, the second highest peak in Bulgaria and the highest in the Pirin Mountains. A scenic path goes steeply up to the Golyam Kazan (Big Cauldron) cirque, bounded by the dramatic 400m high vertical north wall of Mount Vihren. This Karst region is famous for the diversity of endemic or rare plants, with the Edelweiss among them. Small flocks of timid Balkan Chamois can also be seen on the way. After a strenuous climb, we reach the peak and enjoy the breath-taking view of the surrounding mountains. On the way back we will take a short break at the oldest tree in Bulgaria, over 1300 years old. (6-7 hrs, uphill/downhill walking: 1000/1000m). Accommodation: Mountain hut in a dorm with shared facilities (day 2) and family-run pensions (rest days) in en-suite rooms on halfboard (breakfast & dinner included). The price includes: transfers from/to Sofia Airport and all ground transfers as per program; accommodation and meals as mentioned above; English-speaking mountain guide; lift tickets; VAT and all local charges. The price does not include: museum entrance fees; other meals and drinks; tourist maps (can be requested in advance when booking the tour); tips; medical insurance; alcoholic drinks; personal expenses.